The Silver Line is a limited-stop bus route with some bus rapid transit features operated by the Los Angeles County Metropolitan Transportation Authority (Metro). The Silver Line route runs between the El Monte Station, Downtown Los Angeles, South Los Angeles, the Harbor Gateway Transit Center in Gardena and San Pedro. The Silver Line offers frequent, all-stops service along the El Monte Busway and the Harbor Transitway, two grade-separated transit facilities built into the Los Angeles freeway system. The Silver Line was created as part of the conversion of the El Monte Busway and the Harbor Transitway from lanes reserved for buses and high occupancy vehicles into the Metro ExpressLanes that allow solo drivers to pay a toll to use lanes. The tolls collected have been used to operate the Silver Line and to improve amenities at stops. The eastern section of Silver Line route runs on the El Monte Busway between the El Monte Station in El Monte and Union Station in Downtown Los Angeles. The southern section of the route runs on the Harbor Transitway between 37th Street/USC station in Downtown Los Angeles and the Harbor Gateway Transit Center near the city of Carson. Buses travel between the eastern and southern sections along surface streets in Downtown Los Angeles where Silver Line buses make a limited amount of stops (11 in each direction) near major employment centers, tourist destinations and Metro Rail stations. Silver Line route 950 trips continue south of the Harbor Gateway Transit Center along the Harbor Freeway to San Pedro traveling in general purpose freeway lanes and making two stops en route at stations located on the side of the freeway near off and on ramps. In San Pedro, Silver Line route 950 buses once again travel along surface streets, serving the Harbor Beacon Park & Ride and making frequent stops along Pacific Avenue. Like the other Metro Rail and Metro Busway lines, the Silver Line operates on a proof-of-payment system. Passengers may board at either the front or rear door of Silver Line buses and validate their Transit Access Pass (TAP) electronic fare card at readers located on board the bus, near the door. Metro's fare inspectors randomly inspect buses to ensure passengers have a valid fare product on their TAP card. In the early 2000s, Metro began depicting the two busways on its Metro Rail maps, and in 2008, Metro once again looked at the concept of linking them with a "Dual Hub Bus Rapid Transit" route. The service was rolled out as the Silver Line in December 2009. Five Metro Express lines were truncated to terminate at either Harbor Gateway Transit Center or the El Monte station, where passengers would transfer to the Silver Line to continue into Downtown Los Angeles. 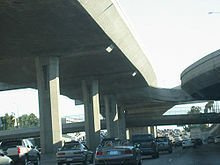 As part of the Metro ExpressLanes project to convert the El Monte Busway and the Harbor Transitway from lanes reserved for buses and high occupancy vehicles into high occupancy toll lanes that allow solo drivers to pay a toll to use lanes, aging stations were refurbished and frequencies on the route were improved; the most drastic change was the complete reconstruction of El Monte Station which was demolished and entirely rebuilt, reopening in 2012. LADOT added bus priority to traffic lights to improve on-time performance in Downtown Los Angeles in the same year. A new transitway station for the Metro Silver Line will be located at Patsaouras Transit Plaza at Union Station to provide better access to bus, Metro Rail, Metrolink and Amtrak services. As of April 2017[update] the station is under construction, and is expected to open in the spring of 2018. Seven passengers waiting on the northbound platform of the Harbor Freeway Station received critical and serious injuries when a private vehicle entered the station and struck the platform on February 22, 2012. After the accident Metro studied the design of the Silver Line stations and decided to add concrete filled metal bollards at the platform edge of a number of stations during August 2012. The bollards are spaced close enough to stop a car from entering the platform, but have enough room to allow multiple buses to stop at the platform and lower the accessibility ramp. ^ a b "Metro Ridership". Metro.net. Los Angeles County Metropolitan Transportation Authority. Retrieved April 2, 2016. ^ "Guide to the Metro Silver Line". The Source. ^ "Line 910 fare structure" (PDF). 2009-10-15. ^ "Metro Silver Line | All-Door Boarding Pilot". www.metro.net. Los Angeles County Metropolitan Transportation Authority. Retrieved June 25, 2016. ^ Weikel, Dan (December 2, 2014). "A cleaned-up, safer Harbor Transitway puts more commuters on the bus". Los Angeles Times. Retrieved March 9, 2015. ^ "Dual Hub Bus Rapid Transit (BRT) El Monte Station to Artesia Transit Center" (PDF). 2008-11-20. ^ "SB910 Feb09 public hearing" (PDF). 2009-02-01. ^ "Metro Silver Line Update Report" (PDF). 2012-01-19. ^ "Metro Silver Line (service tab)". ^ Mendelson, Aaron (February 19, 2015). "How late are Los Angeles buses and trains? Depends which line you're riding". KPCC - Southern California Public Radio. Retrieved April 2, 2016. ^ "Source: Accident on The Harbor Transitway". February 22, 2012. Retrieved April 12, 2019. ^ "Harbor Freeway Metro Silver Line Station platform improvements" (PDF). 2012-04-20. Wikimedia Commons has media related to LACMTA Silver Line. Metro Silver Line timetable – as of June 2013. Silver Line Map – Overall map of the Metro Silver Line. Metro's official release about the New Metro Silver Line Released on December 9, 2009.